What would you do if you had a giant statue of Lenin to get rid of? One statue of Lenin; slightly used. Unless you’re a closet communist or you think Lenin wore his mustache really well, having a statue of the guy knocking about is not really the best ice breaker at a party. Hearing someone say, ‘Communism, how’d that all work out then?’ tends to be most people’s cue to leave these days. The Ukranian government obviously agrees with me given the law that they passed in April. The law in question says that all symbols of the country’s former communist regime must be removed or otherwise disposed of. Sort of like when you grow your hair long during college and then frantically try to delete all the pictures from Facebook. The simplest way to do this (the statue thing, not the Facebook thing) would be to take a sledgehammer to everything bearing the old hammer and sickle. However a more… forceful approach was thought up when people came to deal with the statue of Lenin. According to IGN, the original Dark Lord of the Sith is very popular in Ukraine. So converting on of the founders of the Soviet Union into one of the founders of the Galactic Empire was a no brainer apparently. 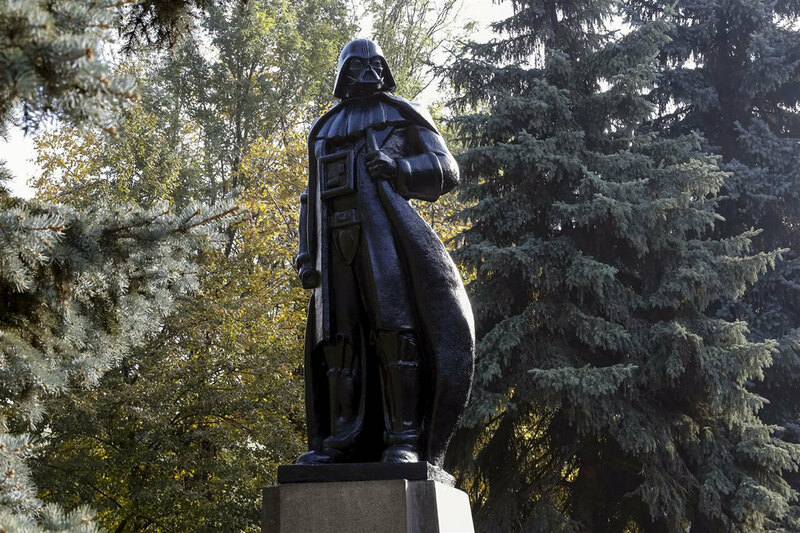 What other famous statues should be replaced with Star Wars characters?